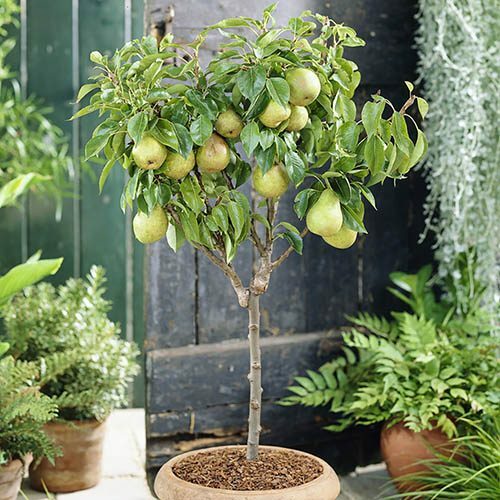 The perfect Patio pear tree for growing in small gardens, or where space is a premium. It really is like an orchard pear tree in miniature, except for the size of crop and size of fruits! Being very slow growing it will barely reach 1.2m (4ft) in 10 years or so. One of the easiest of all patio fruit trees to grow, it's definitely one for the shortlist. Supplied as a dwarf, well-branched tree at 50cm tall, bare root. The perfect Patio Pear tree for growing in large pots or small gardens, where space is a premium. Part of the world-leading Zaiger range of self-fertile and dwarf patio fruit trees, the dark green and juicy fruits of Garden Pearl will delight. It really is like an orchard pear tree in miniature, except for the size of crop and size of fruits! Being very slow growing it will barely reach 1.2M (4ft) in 10 years or so. Self-fertile, so very easy to grow, it produces lovely pure white blossom displays in April, followed by luscious juicy pears in late Summer. One of the easiest of all patio fruit trees to grow, it is definiteley one for the shortlist.